112 pages in an A4 format with a card cover. 14 colour photos and 59 in B&W, 94 full colour aircraft profiles plus 26 other forms of art-works including line drawings and colour camouflage paterns. Very comprehensive and set out in a logical way, excellent profiles with matching photos. Most other books of this type cover just individual aircraft or the entire late war Luftwaffe. This one is on includes the Bf 109 G-5/AS, G-6/AS, G-14, G-14/AS, G-10 and K-4. I would have to answer yes, especially when they are done with this level of detail and documentation. This title covers the last six variants of the 109 and the author then goes to great length to show the schemes produced by all of the various factories which manufactured each of those types. After a short introduction, the author gives us the major modifications done to the 109 from the G5 onwards. This includes the development of the DB 605 engine, vertical tail units, canopies, manufacturers and colours. Each chapter describes how each aircraft type was affected by these modifications including line drawings and photos where required. 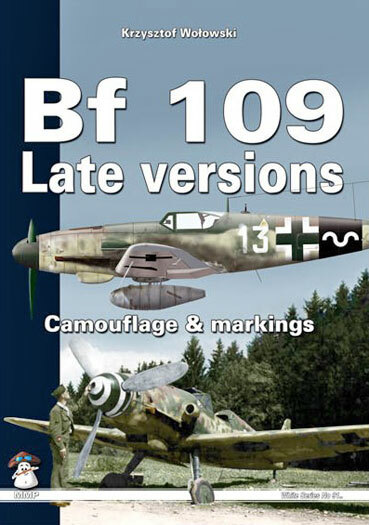 We then get into the nitty-gritty of the book beginning with the Bf 109 G-5/AS. As few G-5s were converted to AS specs, so this chapter is relatively short with only one side profile, plan view and one B&W photo plus a line drawing profile. The next chapter, Bf 109 G-6/AS is a bit larger with six colour profiles, line drawings showing the difference from the standard G-6 and one B&W photo. Bf 109 G-14 (G-6/MW50) sets the pattern for the rest of the book - several wartime colour photos and many in black and white plus 14 side and plan view full colour profiles of specific aircraft. Line drawings of the aircraft and coloured camouflage artwork showing the different patterns from each of the factories involved. The individual aircraft profiles, mostly Luftwaffe but some also from Germany's allies, a couples of captured birds in RAF schemes and even a Czech built post-war 109 G-10 in the red and grey scheme. Some show just a left or right profile while others give you a full four views. The camouflage profiles are shown with all of the late-war colours including, where appropriate, bare metal and RLM 84, national markings plus upper and lower wings where the camouflage has changed. The line drawings are in 1/48th scale and are accurate showing all of the differences of all of the various models and marks. On the last two pages is a set of plans showing all of the stencils that could be applied to G and K aircraft but states that many and some times all could be left off. This book from MMP has got to be one of the best on this subject that I've ever seen and is a welcome addition to my growing library and is therefore recommended to all. Thanks to Mushroom Model Publictions for the sample.